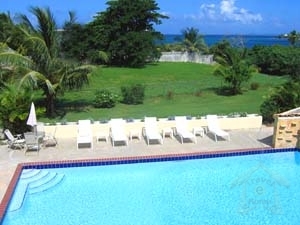 Casa Ladera is a beautiful rental property in Vieques, Puerto Rico. There are three two-bedroom units at Casa Ladera, and each sleeps four adults very comfortably. Each two-bedroom unit can be rented by a separate group, or jointly by larger parties of up to 12 people. 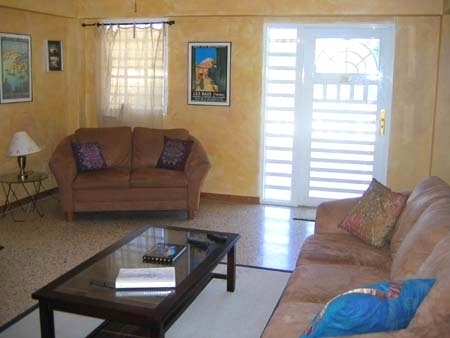 The property is located on the north coast of Vieques, in the neighborhood of Monte Santo Playa, just minutes by car from the airport, ferry and main town, and less than a minute\'s walk from a secluded and lovely beach. Enjoy sweeping views of Culebra, its surrounding islands, the Vieques lighthouse and mainland Puerto Rico as you relax and unwind. These spacious and idyllic accommodations are surrounded by colorful fruit trees, fragrant flowers, and tall palms. Swim in our huge 20x40-foot pool with magnificent ocean views, or relax in the pool bar with a drink or a snack.